The KCC was co-founded by Jenni and Conrad Anker, with the support of the full board of directors from the Alex Lowe Charitable Foundation. Influential members of the local Sherpa community were also crucial to the centre’s development. Including Chhongba Sherpa, Panuru Sherpa, Lhakpa Sherpa and Lhakpa Norbu Sherpa. On the whole, the centre’s resources focus on the development and training of the vital indigenous Sherpa and mountain guiding community in Nepal. In a region where many families and communities have lost loved ones to the mountains. Moreover, the KCC is doing all they can to enhance the mountaineering knowledge of the local people. They hope to raise the margin of safety when working in high mountain terrain. The foundation was set-up by Jenni-Lowe Anker after the sad loss of Alex Lowe in a mountaineering accident. Shortly after the establishment in 1999, the foundation was also joined by professional mountaineer Conrad Anker. Altogether, the founding members of the KCC have been touched by the friendship and support they have found within the people of this region. The efforts and resources invested have had a direct impact on improving the safety and wellbeing of all climbers and hikers who enter the valley surrounding Mount Everest. The 20th May 2018 marked two remarkable feats in Favre-Leuba’s history. Namely, the success of the Raider Bivouac 9000 in the inhospitable climate at the top of the world. Followed by the accomplishment of our alpine ambassador Adrian Ballinger attaining a new home-to-home speed record for an Everest mission. Adrian Ballinger is a world-class mountaineer with a history of setting new standards in high alpine environments. Furthermore, he has successfully completed 8 summits of Mt Everest including one without supplemental oxygen. Also, he has established astonishing speed records, such as the one from May 2011 ascent of Mt. Everest twice and Lhotse peak. Thus, becoming the first person (along with 2 Sherpa teammates) to climb three 8,000-meter peaks in only 3 weeks. However, Adrian also commits significant time to supporting others in the mountains. He was the only non-Sherpa member of the Everest summit rope-fixing teams in 2010 and 2011. 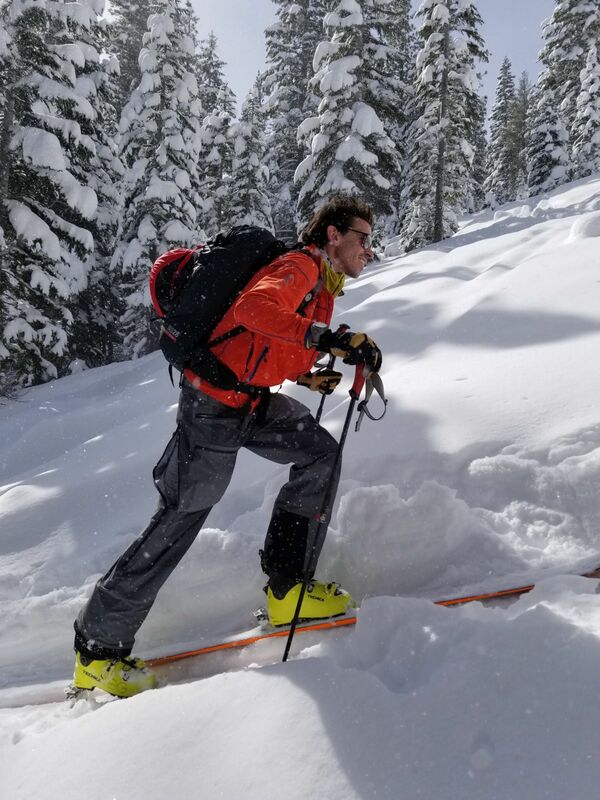 Additionally also being the only American mountain guide to hold both AMGA/IFMGA certifications and have more than 15 summits of 8000-meter peaks. Moreover, these accreditations allow him to take small groups of mountaineers into the Himalayas and educate them in these intense and extreme regions. Adrian teamed up with Favre-Leuba for his 2018 climbing missions. He has pioneered a new approach to climbing in the Himalayas termed the ‘Rapid Ascent System’. As a result, the revolutionary method minimises the number of days needed for acclimatisation. All in all, it also ensures he and his team can physically handle the rigours of continuous climbing in such high altitudes. A demanding regime of extensive low-intensity endurance training that involves climbing 4x 1,200-meter elevations per week. Also, on big days this stretches to 2,400-meter ascents also coupled with fasted climbs. Before leaving for the Himalayas, Adrian also spends eight weeks acclimatising at home in hypoxic tents that allow him to adjust to an altitude of 5,600 meters. The extensive physical preparation created the opportunity for him to combine elite athleticism with his ultimate mountaineering efficiency. In essence, it would pave the way for his success in achieving the fastest ever door to door ascent of Cho Oyu and Mount Everest, from the US and back, in only 23 days. Furthermore, the new Rapid Ascent System, and Adrian’s extensive Himalayan experience and mountaineering prowess, enabled him to climb Everest in only 9 days, a feat taking most climbers 65 days. Throughout Adrian’s preparation and ascent, his Favre-Leuba Bivouac 9000 altimeter watch was harnessed to his wrist. An indispensable alpine companion. Notably, it’s internal mechanical air pressure and altitude system provided accurate barometric readings to Adrian. While attempting to summit Everest the team encountered a severe oxygen equipment malfunction. They thought their summit window had closed. However, the Bivouac 9000 indicated an incoming high-pressure system. Coupled with updated weather reports from base camp offered new hope. Finally, a small weather window was confirmed. It provided enough time to reach the summit and descend back below the ‘death zone’ of 8000 metres, in all safety. Favre-Leuba’s legacy is built upon the bold and pioneering spirit of mountaineering. The original Bivouac released in 1962 became synonymous throughout the climbing world. Finally, a timepiece to accurately calculate altitude. Straightaway it became renowned for joining the likes of Walter Bonatti on defining climbs in the Grand Jorasses. Furthermore, Junko Tabei wore the first Bivouac on the summit of Everest while becoming the first female climber to ascend to the roof of the world. 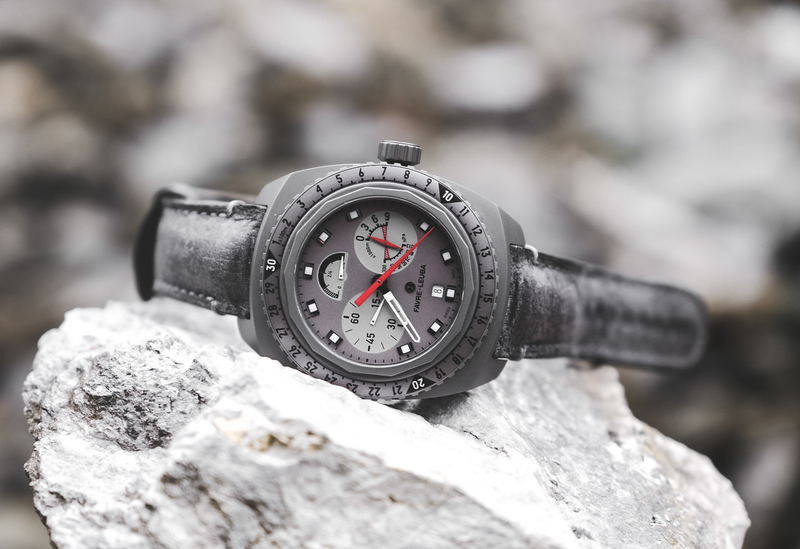 In 2018, our new Raider Bivouac 9000 became the first mechanical altimeter wristwatch to accurately calculate altitude and time on the 8848-meter peak of Mount Everest. This genuinely ground-breaking moment saw the mechanical wristwatch redefine its place as indispensable in the high grounds of the Himalayas. In a terrain where shattering winds and sub-zero temperatures can cause chaos with digital instruments is where Swiss mechanical engineering can thrive. 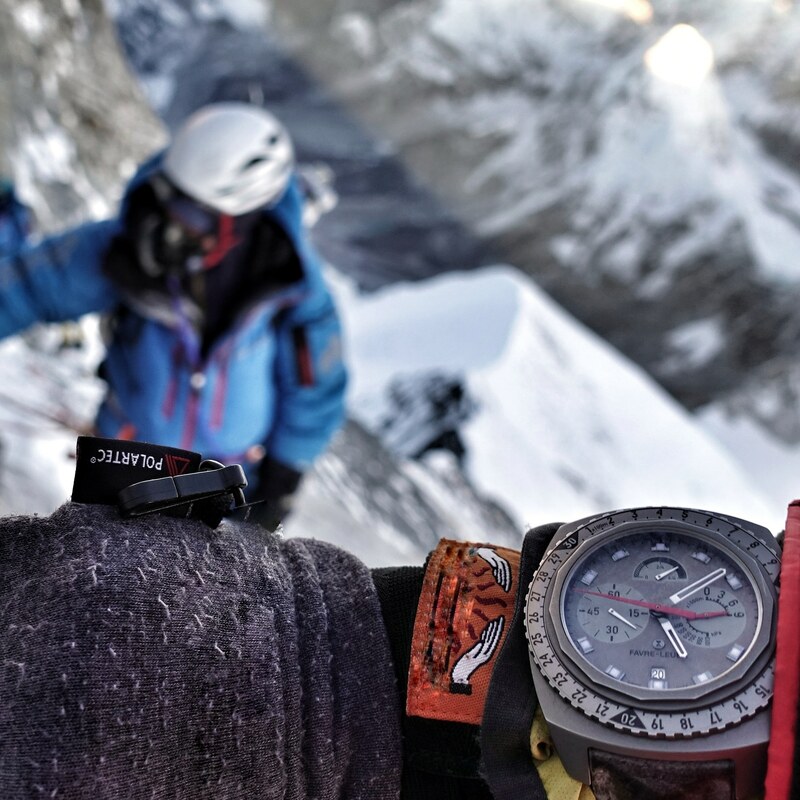 To commemorate this achievement, Favre-Leuba will be auctioning Adrian Ballinger’s Everest summit timepiece in Geneva on the 12th May 2019. The case back has been engraved with the defining date and altitude of the summit. Importantly 100% of the proceeds received will go towards supporting the Khumbu Climbing Centre. Above all, a cause dedicated to teaching a wide range of mountain safety skills to the local Nepali community. Teachings at the KCC cover topics such as mountain safety and rescue, wilderness first aid, technical climbing knowledge and English communication. 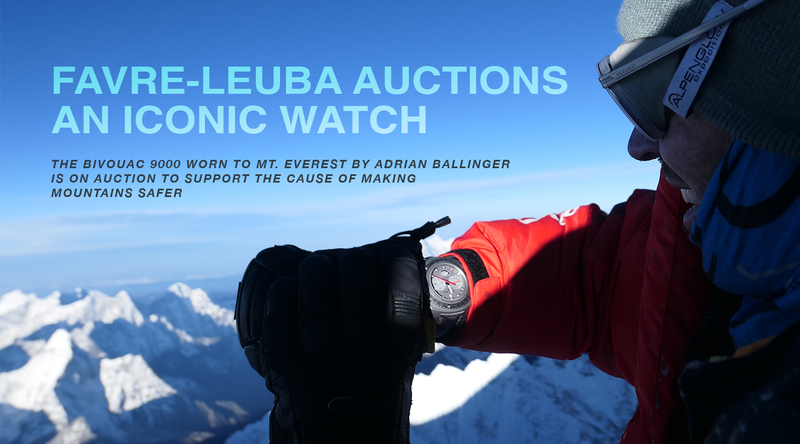 We hope the auction can help contribute to the ongoing efforts to improve the safety and wellbeing of the Sherpa community and all those who enter the region.